I’m a big fan of Israel and with that I’m also a fan of its cuisine. The first stop off any flight I have to the mother country, is always to get my shawarma and falafel fix. I mean even the best falafel and shawarma in the U.S is comparable to the worst shawarma and falafel in Israel. You literally cannot go wrong at the local shawarma joint on any block. Since I can’t always be in Israel, even though I wish I could, I try and bring these flavors to my table on a pretty steady basis. I have found that with Meal Mart shawarma Sausages they are a little taste of Israel in a fun form. 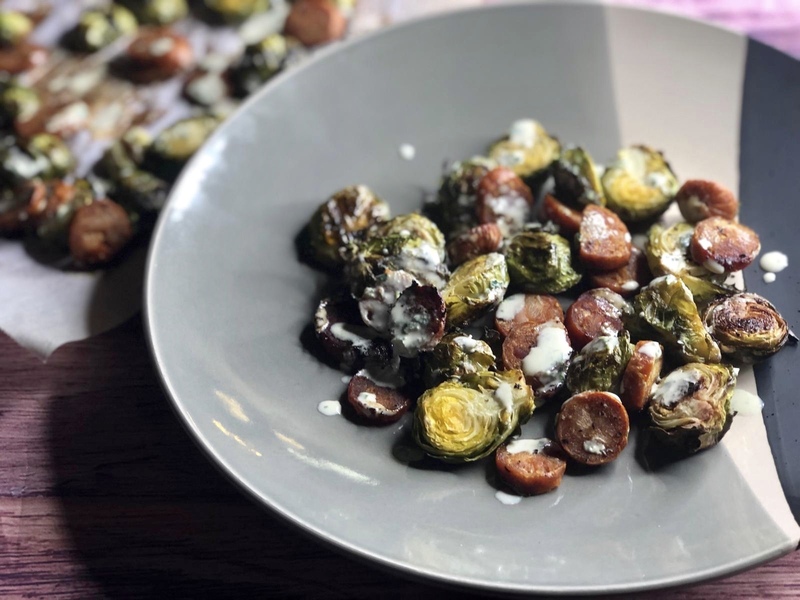 I’ve been playing around and adding them to many things and one of my favorite way of eating them is with roasted Brussel sprouts and techina. Brussel sprouts when roasted lend a sweetness that I can’t get enough of, add that to the lamb and spices in the sausages, and the nutty techina and I’m a happy camper. I hope you enjoy this as much as my family does. On a sheet pan lay out Brussel sprouts and drizzle the olive oil and sprinkle salt and pepper to coat. Mix on the sheet pan so the flavors are evenly distributed. Place the sausage around the Brussels trying to make a single layer so it caramelizes and doesn’t steam. Roast about 15- 20 minutes until the Brussels are browned and crispy and the sausages the same. Drizzle with techina and serve right away.